It is cold. I am cold. I will be cold until May. That’s part of life and I know it. But I will fight it. My hands get so cold typing sometimes, that I decided it is high time I did something about it. I flipped through patterns and dug through yarn and came up with this combo: wool yarn dye with pink lemonade (warm and springy) and Fetching from Knitty. I cast on, knit, knit, knit, knit, knit, bind off, try on, decide nope. Too much finger still showing. My fingers deserve to be warm, too. 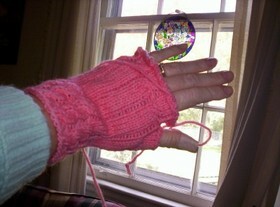 Shall I make these Fetching fingerless gloves into fetching mittens and try something else? Undecided, but I am admiring this yarn. It needs a sweater- a full sized, adult, long sleeve, maybe even bulky sweater- to stuff in its gaping maw. My hand reaches for a stack of magazines to look through, but I slap it away. I will be strong and finish something I've started. Mostly because if I don’t get some of those UFOs out of the way, I’ll never be able to get to the Christmas decorations. In an old, torn Christmas gift bag, I find it. The most expensive sweater I have ever (almost) knit. I was in a yarn shop in Hendersonville, NC. The first yarn shop I’d been in in years, and the very first since my hobby became an obsession. There on the wall hung a soft, squishy, subtly striped, turtleneck sweater, and I thought as compulsive knitters do, I must have that, I must knit it and wear it while I knit more sweaters. The sales lady helps me pick out the colors of Alpaca Boucle I want. My stomach audibly growls as I pull out my checkbook, knowing that it will suffer the consequences of my hasty but inescapable decision. Ah, memories. I gently place the sweater in my bag, squeezing each skein to luxuriate in it’s alcaca-y goodness, ignoring the fact that boucle is a booger to knit because you can’t see the stitches or tell if you’ve dropped one in the dark, which I why I never finished it to begin with. Much better I think, although there is still a little room for something else if need be. After all, I did just order yarn for Christmas knitting. And I should start another baby sweater and more hats. And a scarf. And a sweater for Hubby. And one for my sister. We all know I’m talking about Second Sock Syndrome here, but a quick Google search reveals that SSS also stands for Selective Service System, Social Security System, System Safety Society, Sunshine State Standards, Spread Spectrum Scene (dare you to say that one three times fast), and Symposium on Self-Stabilizing Systems. Take your pick, but I’m knitting socks. I’ve been knitting them since about this time last year. Monday is Hubby’s birthday, and I’m determined to have them finished, wrapped, and ready for gifting. If not, I’ll check out the Spread Spectrum Scene and he’ll get them for Christmas. 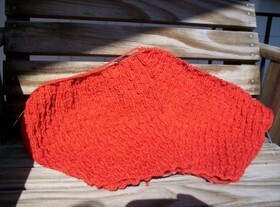 The Knit Baby Surprise group is diverting from its usual EZ knitting and is knitting a fan and feather shawl. I’ve wanted to knit a winterish shawl. I have a couple of summerish ones, but they aren’t warmish enough. So here I go. The pattern is from one of the members; the yarn is an unlabeled mohair blend from my stash that seems to keep growing despite my not buying much lately. I’m wondering if it needs a chaperone. All parts are knit for my fall sweater. (Yes, I know the picture looks like a red blob, but it's actually rust colored and there are individual parts layed together to give the illusion of being a finished sweater. If you click on it, you'll get a slightly larger picture that looks a little more sweaterish.) This won’t be too bad finishing- just sewing up, no button bands or anything. Just sewing up. Yep, I just have to sew it up. Sew it up. Maybe this would be a good time to start something new…. And more stuff. Hats. I’m way behind on hat knitting. These are for Ship Support. Think I’ll concentrate on hats for them this month, then get back to knitting for the homeless shelter. The orange hat is actually red. A very red red. The black hat is a black hat. Scarves. Brown and black. Caron Simply Soft, 2 strands, #13 needles. The Yarn Harlot’s pattern. October marks the beginning of candy season- Halloween, Christmas, Valentine’s Day, then ending with Easter. Throw in Thanksgiving, candy sales and Girl Scout cookies, and I’m in hog heaven. Literally. But that’s okay. You can hide a lot in a sweater. With temps dropping to the 30s tonight, bring on the mini Milky Ways and pull out the woolies! This candy corn at least is low in sugar. 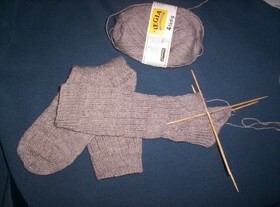 Mountain knitting also included beginning the sleeves for my wooly fall sweater. 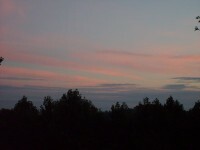 It rained Saturday night and on and off Sunday, but we got in a long walk, and the clouds made for a beautiful sunset. The leaves are just beginning to change; in a couple of weeks they’ll be amazing. Allison got in a little studying for the SATs, and Cocoa stalked wild animals (that's a viscous turtle). Also on the wild animals sighted list are a flock of turkeys, a lizard, and a frog. Oooo- scary. Also another mouse in a trap. Ick. Top it all off with a roaring fire, chick-flicks, hot chocolate, and gummy bears- wonderful weekend. Another notch in my Book Challenge belt, and this one was very good. I love reading first novels by an unknown writer that make me want to say, “Ha! you mediocre best-selling novelist, now this is writing!” My original challenge list included The Devil Wears Prada. A couple of pages into it, I decided reading it all would be like knitting a sweater with yarn I hated and knew all along wouldn’t fit. So I stopped reading. This was a big step for me. I have a hard time finishing knits, but a harder time not finishing a book I’m not enjoying. I feel obligated. Now I'm on my way to recovery. Note: If I have offended you in any way by not appreciating the merits of The Devil (and I acknowledge there must be some as it has been made into a movie) you are not alone. I have a habit of speaking freely when it comes to books and offending someone. I once told someone that I didn’t care for Nicholas Sparks. I read a couple of his books and found them too formulaic, too sappy- emotion driven rather than plot or character driven. Of course, NS is “someone’s” favorite author. In a more recent book discussion, we all agreed The Kite Runner is a must read. Then The Divinci Code had to be brought up, and I had to be asked first, “What do you think?” I told the truth. It received a lot of undeserved hype due to the subject matter. Over all I felt the basic premise was interesting, but it was so poorly written I had to struggle through at times to finish it. I can’t enjoy a book if I have to stop and think, “I would have said blah blah,” or “Ooo, wrong use of that word,” or “That's awkward.” Too much thinking about the writing when I just want to immerse myself in a good story. Of course everyone else loved it and I created an awkward silence. If only this didn’t keep happening at my in-laws’ house. Now that I have criticized your favorite books, I will shut my mouth, start the next book, and show you what I knit this week. 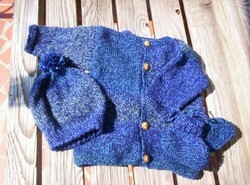 I needed a baby sweater fix, so I finished the blue set- buttons and all. It’s really too long, but I get carried away sometimes. The good thing about not looking while you’re knitting is that you don’t have to look while you’re knitting. The bad thing is, sometimes you knit too far and don’t feel like ripping out because you are knitting in the car and you don’t want to get car sick putting the stitches back on the needle so you just keep going. Otherwise, it came out okay. 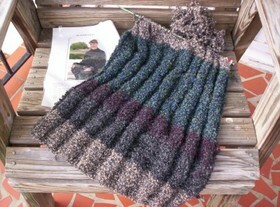 The pattern is from a Knitter’s magazine, the yarn is Wool Ease sport. 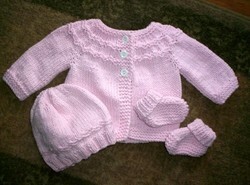 The pink set is the Little Lambs pattern from the Leisure Arts book “Precious Layettes.” The yarn is Cotton Ease. I’m so glad LB is bringing the yarn back. I love knitting with this stuff, and it’s perfect for babies. DD#2 and I are packing up to go to the mountains for a couple of days. She wants some time away from distractions to study for the SATs, and I just like to go. I’m taking my fall sweater (It was put on hold so I could use the needles for the pink sweater. Why is it I couldn’t find another #8 circular when I probably have half a dozen?) 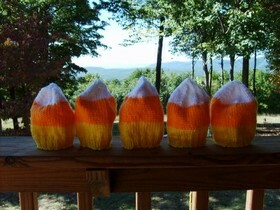 and yarn to knit candy corn hats. I’m also taking a book, a bunch of chick flicks, lettuce, a bag of junk food, and a larger bag of scrap wood to build a large fire in the large fireplace. And my hiking boots. And Cocoa. And an electric blanket incase we can't figure out how to turn on the heat. See ya'.